Scotland’s Chambers of Commerce have gone public with their criticisms of the rail network North of Perth which they describe as “not fit for purpose”. Given that the last major investment made there was the Inverness & Aviemore Direct Railway over Culloden moor (completed 1898), they may have a point. The timing is no coincidence as the Scottish Government’s Rail 2014 Public Consultation completes this month. Those who travel by rail North of the Central Belt will know what SCC is on about. Though ScotRail use (mostly) Class 170 Turbostar 3-car trains to Aberdeen and Inverness, they are crowded and uncomfortable for a 3+ hour journey and services beyond are slow 2-car Class 154s. The North lines from Inverness to Perth, Kyle, Aberdeen and Thurso are each about 100 miles long or 2 hours’ driving. The respective trains take 2 hrs, 2.5 hrs, 2.5 hrs and 3.5 hrs. Hardly competitive. Given the difficult landscape and absence of any investment, not much could be done on these four lines without significant investment in infrastructure. The remaining Glasgow-Edinburgh-Aberdeen triangle is another matter. While the Edinburgh-Glasgow Improvement Programme (EGIP) is welcomed, as well as long overdue, it will only provide catenary electric power on the main Glasgow-Edinburgh link and as far North as Dunblane. This will do little to address the SCC’s complaint, nor, in my opinion, start to exploit longer-distance travel within Scotland. At the moment, travelers to Aberdeen are in rather poky 3-car Class 170 Turbostars—adequate for short-haul but not the 150-odd miles to Aberdeen on which they are eternally overcrowded and poor in facilities. They can barely seat 140 standard, plus a dozen First Class passengers. While I support projects like the recently completed Alloa line and think both Borders and St Andrew are long overdue to be reconnected to the network, what is missing is some ‘big’ thinking to ratchet rail travel in Scotland up closer to continental standards. That would take new thinking by both ScotRail and the Minister and involve new trains and some track improvement. A ‘feature’ (I’m being kind here) of the Tory rail privatisation was to split track, rolling stock and operators from one another: Network Rail does the track Rolling Stock Operating Companies lease the trains and (in Scotland) ScotRail runs them. The length of leases entered into between ROSCOs and TOCs are generally equivalent to the length of the franchise agreements for the provision of rail passenger services. At the end of the current ScotRail franchise all leases for trains operating in Scotland will terminate, except for the new Class 380s where we have given a commitment for longer leases as it was more commercially advantageous to do so. Electric rolling stock has lower lease costs than equivalent diesel units, and they are also more reliable and cheaper to maintain and run. Long-term, the Aberdeen triangle must be electrified but what would revolutionise it in the meantime (and justify such investment) is new trains. Currently there is no such thing as an Aberdeen express but there should be. Currently it takes three hours because each train stops at every lamp post. If you want to be in Glasgow/Edinburgh for a 9 am meeting, you must catch the 05:33/05:56—and even then it’s tight. This is short-haul, Central Belt thinking. It provides 15 trains a day to each of Glasgow and Edinburgh. EGIP will release many Class 170s for use elsewhere, so these could lengthen the trains—but not improve them. What we need is a fresh thinking. What we need is an express service between Aberdeen and Glasgow, stopping only at Dundee, Perth and Stirling. Using tilting Class 222 Super Voyager (like Cross-Country use), journey times could be cut to barely 2 hours. A fleet of 12 5-car units could provide an hourly service, each with 250 standard and 100 1st class seats. Add in another five units to provide non-stop Dundee/Edinburgh and Stirling/Edinburgh express service that connect with the Glasgow service and you have yourself a railway. Naturally, the first question must be: can we afford this? Well the Class 170s we have each cost around £750k per annum to lease. Even if they’re full, their revenue per trip can’t be more than £3k. Assume 3 trips each 5 days per week with a couple of weeks in the sheds and each train will gross £2.25m each year. Even half-full, a Class 222 will gross £7m. Given a lease cost for a used 5-car set of around £3m, that still earns more than the Turbostar. And those Turbostars would still have a job—forming a twice-hourly service from intermediate stations (including the Dunblane-Stirling-Edinburgh service) and feeding passengers into the express stops. 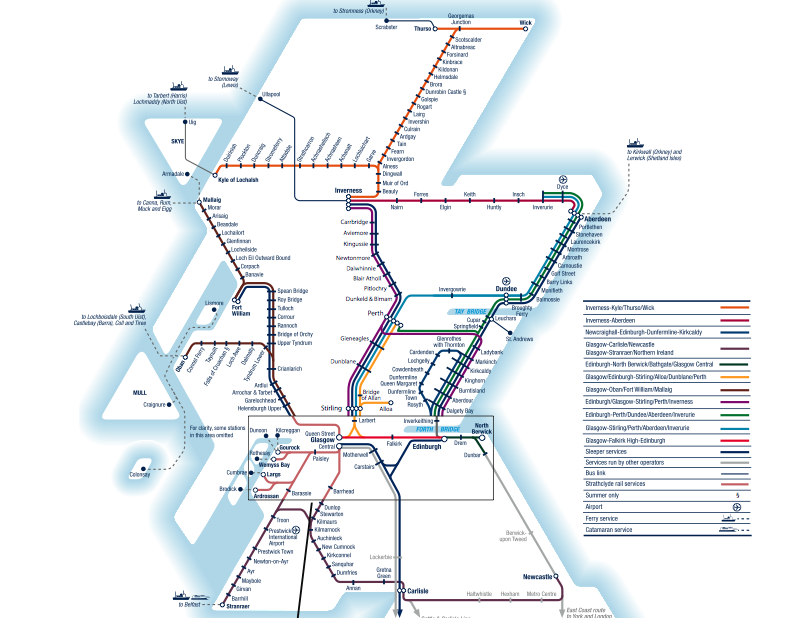 But, more importantly, this ratchets the backbone of Scotland’s rail network up into a 21st century class and means (with EGIP) four of Scotland’s cities and two of its main towns have superb interconnections. ScotRail has gone from 58m to 78m passengers each year but this is the way to keep it climbing. Somewhere in the £738m we are paying to have rail services (plus the £800k we pay in fares) there must be the latitude for the £40m investment that will pay for itself after the first year. This step would focus future investment on signalling and doubling of the single-track line still in use South of Montrose. It would also trigger us getting serious about rail investment in the more expensive Inverness connection so that all our cities enjoy a decent level of communication. But best of all, car travel would drop, rail travel multiply and business would embrace catering, WiFi and opportunity to work in first class conditions. On the 9pm train to Glasgow after visiting Edinburghs lovely sites.So to the point the seats on these electric trains are brick hard & very sore to sit on.The newer electric on the Ayr line are far better,Scotrail are only imterested in profit not passenger comfort maybe a better company would do a better job than Scotrail they don,t deserve another contract renewal.Train designers must desigh seating that is good for a human spine not torture it like these awful seats do!